If you are looking for some colorful eggs and thieving bunnies, you are in the wrong place! Easter celebrations here in Spain are no joke. During Semana Santa (‘Holy Week’) people all over the country come together for religious ceremonies, honoring the Passion of Jesus Christ. 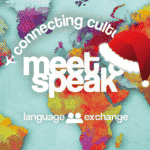 Precessions are held on the streets of almost every city in Spain. While the celebrations in each city similar, each has its own particular customs and practices, some even being commended by locals and tourists for going far and beyond the spirit of Semana Santa. 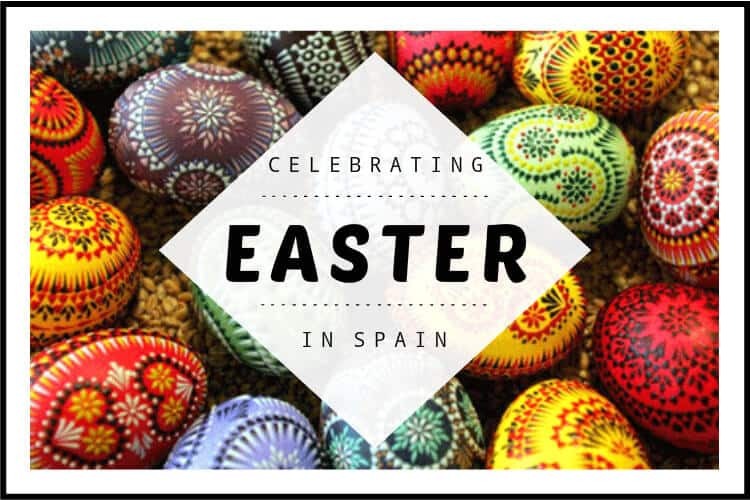 If you are thinking about traveling and visiting a different Spanish city this time of year, read up on the various Easter festivities held in other popular regions in Spain. 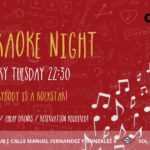 This region is known to attract the most tourists during Semana Santa, and with reason. For a whole week, the south of Spain is filled with sensational processions, religious passion, and colorful art. 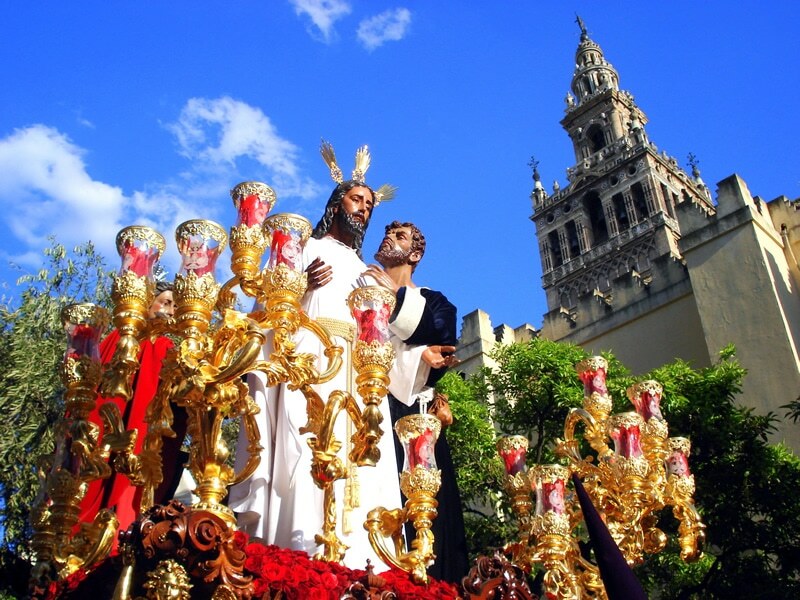 The most magnificent and unforgettable Semana Santa celebrations in Andalusia take place in Málaga and Sevilla. Both cities witness people crowd into the streets to watch the grand parades and festivities. Sevilla is without a doubt the winner of Semana Santa celebrations in Spain. 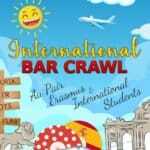 Make sure to book a hostel way ahead of time! Semana Santa in Sevilla is currently an internationally famous event (hint: if you think ‘Easter’, think ‘Sevilla’). Walking through the streets of this historic city you will see people from all over the world, coming together to celebrate the Passion of Christ. Massive and extravagant floats called pasos make their way through the crowd, holding life-size painted wooden sculptures of biblical characters. These sculptures are not recreated each year, rather they are masterpieces dating back to the 16th century. People called costaleros carry the pasos on their shoulders during the parade. Another unique characteristic of Holy Week in Seville is La Madruga which can be translated to ‘the early rise’. This is a tradition that begins at night on Holy Thursday and continues onto Good Friday, in which all of the processions embark on their march to the Cathedral. In Sevilla, La Madruga is surely the most important event of Holy Week. In Málaga, Semana Santa celebrations not only involve religious praise but also pay tribute to military soldiers, veterans and their families. There are also floats carried throughout the streets by hundreds of church members, surrounded by penitents wearing eye-catching purple robes and women holding lit candles. Each float depicts a scene from the Passion. The air is also filled with live Spanish music and cheering. 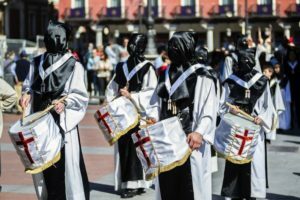 While the Semana Santa festivities in Andalusia are definitely the most spectacular, colorful, and passionate festivities in Spain this time of year, the region of Castilla y León takes on a different approach. In cities such as Salamanca, Valladolid, and Zamora, the celebrations of the Passion of Jesus Christ are seen as more genuine and dignified. In fact, they are the most serious Semana Santa celebrations held in the entire country. Salamanca is home to some of the oldest Semana Santa traditions in Spain. The earliest procession to take place in this city can be traced back to the 13th century. During the week, 22 different processions take place on the streets, each one involving more pasos, along with more ancient wooden sculptures of Jesus Christ and Virgin Mary. Some of these processions are performed by the Brotherhood of the Students at the University of Salamanca, the oldest founded university in all of Spain. The ancient rustic vibe of Salamanca is what makes its Semana Santa festivities stand out amongst the rest. 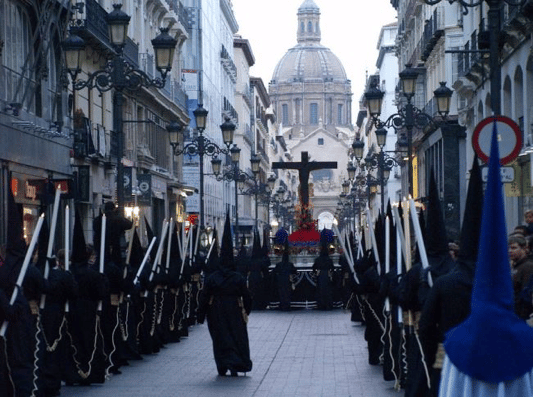 Valladolid, a city smack dab in the center of Castilla y León, is also praised for their Semana Santa celebrations. 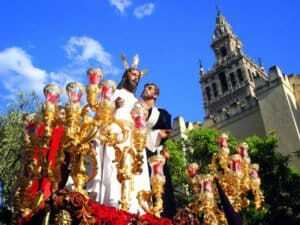 In fact, Holy Week in Valladolid is considered as a Fiesta of International Tourist Interest of Spain. In contrast with the lively, colorful, and spirited celebrations in Andalusia, Semana Santa in Valladolid concentrates on a dedication to silence, devotion and sobriety. Most of the processions that take place are commended for their elegant displays of Castilian religious sculpture, which, of course, was created centuries ago. 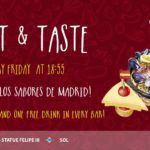 Valladolid does have their own special tradition that makes them unique amongst other cities in Spain. It is called Sermón de las Siete Palabras (Sermon of the Seven Words) and consists of a ritual held on Good Friday morning in La Plaza Mayor. Another unique tradition involves theatrical performances that illustrate scenes from the Passion of Jesus Christ. Move over, Salamanca, because Zamora officially holds the title as the city with the oldest Semana Santa celebrations in the entire country. Just north of its close-running mate, Zamora’s earliest penance procession can be traced back to the 12th century. Each year, there at 17 precessions held throughout the city. Like Valladolid, the festivities in Zamora take on aspects of silence, meditation, and sobriety. 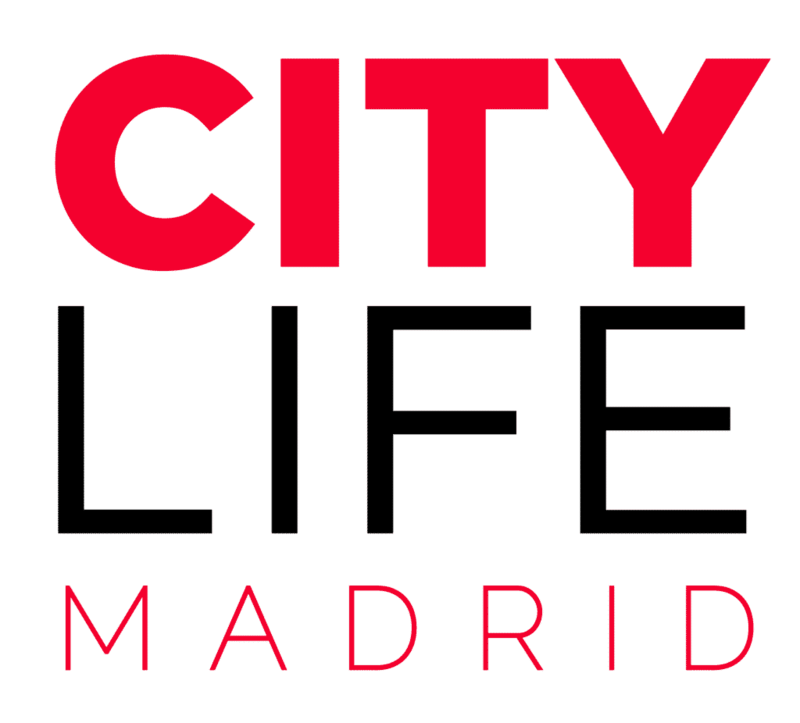 This city is also another title holder of a Fiesta of International Tourist Interest of Spain. Fun fact: Zamora’s population increases by 5 times during Holy Week, sometimes reaching up to 300,000 people, a significant increase compared to its usual 66,000. A culturally unique region in Spain, Cataluña celebrates its own version of Semana Santa that will not always be similar to the processions that take place in the rest of the country. The highlight of these celebrations is the one in Tarragona. Perhaps the most intriguing holy ritual in Spain, The Procession of The Holy Burial of Tarragona, takes place in Tarragona on the Holy Friday of every year. It starts at 20:00 and has 20 parts or “mysteries” which take over 5 hours to complete on foot. It is not only Spain’s longest Semana Santa procession, but also the latest as it ends at 2AM! While not drawing the same fame as the Semana Santa celebrations in Andalucia and Castilla y Leon, the festivities in Aragón are deeply rooted in tradition and taken seriously. Sometimes called “The Intense Week”, Holy Week here brings out the rituals from people all over Aragón. From the beautiful hills close to the Pyrenees, to the old streets of Zaragoza, the history bleeds out of the wide variety of processions and spectacles. To go to Aragón during these days is to simply go back in time, to when there was no more important week of the year than Holy Week. The Aragonese capital goes all out for Semana Santa. It is a city, which is highly underrated and quiet compared to the other sights in Spain, but during Semana Santa the streets come alive again and the city remembers its past through the expression of tradition. There are even masses at Zaragoza’s most treasured sight; the Catedral-basílica de Nuestra Señora del Pilar de Zaragoza. Spanish World Heritage Sites – Al-Andalus!